. : La-Ganiere :|: The region :. 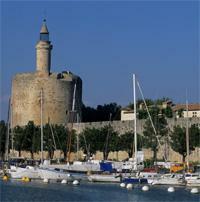 The Gard in the south of France stretches from the Mediterranean to the Ardèche in the north. This area is known for 300 days of sunshine per year and temperatures are high all year long. There is a number of interesting cultural monuments and cities. You will find excellent wines in the Gard, the kitchen is southern-european. The Camargue with its unique swamplands, pastures, dunes and safe, child-friendly beaches are another part of the Gard. Up North in the Gard we have the Cevennes, a mountain range situated in the great outdoors. The land is fertile, the landscape is highly varied with Roman cities,larger and smaller rivers and streams, mountans, forests and fields with heather. Orchards with fruit trees and vin yards are scattered all over the country, surrounded by thym, lavender, fields of rosemary and high plane-trees. The beautiful sandy beach of Stes-Maries-de-la-Mer is on the borders of the Mediterranean surrounded by the unique moors of the Camarque with pastures, dunes and salt pans. Nîmes is well-known for its remains dating back to the Roman age, such as the amphitheatre, one of the best preserved of its kind in the world, and the aquaduct, to name but two. Nîmes attracts lots of visitors with its festivals and bullfights. The city houses fascinating museums, archaeological collections and the old town has a charm all of its own with narrow streets and lovely little squares. Anyone on a holiday in the Gard and Ardeche finds lots of opportunities for trips. The most impressive should be the Pont du Gard, a marvel of architecture, constructed of bricks in Roman style to conduct drinking water from its sources in Uzès to Nîmes over a distance of 50 km. Summer in Uzès is lively with cafés, restaurants, market squares and it offers lots of medieval buildings. The city lies at the foot of the castle Le Duché. Kids will love the candy-mueum, just ouside Uzès. Lovers of the great outdoors will find their scene in the north of the Gard, in the Cevennes. A wide variety of rivers, rocks, forests and heath land is to be visited. Houses in the Cevennes are quite picturesque. 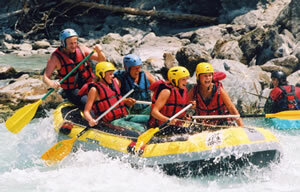 Thanks to its exceptional national heritage, Ardeche is idial for outdoor sports. Besides that there are several picturesque villages as Labeaume, Balazuc. Lagorce and ofcourse the beautiful area of Vallon-Pont-d'Arc. The food is very taste and is blessed with a strong Mediterranean aroma of olive oil, garlic and southern herbs. The coastal region brings oysters, mussels, sardines, sea urchins, and fruits de mer to our plate. Salted lamb is another special dish from the region. Animals feed on the herbs and salted grass of the marsh lands of the Camargue, which gives the meat a tender and marbled quality. This region also provides the first peaches, cherries and apricots of the year. We have a lovely Mediterranean climate in the Gard with long dry, warm and sunny days setin a cool breeze. The early and late seasons are pleasantly mild. Feel like activities in or on the water? 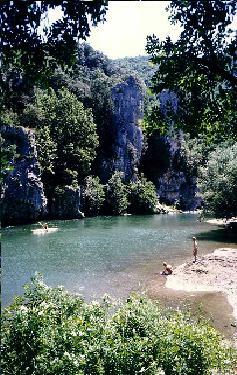 A number of rivers invite you for a swim, such as Ceze, La Ganière, Chassezac and the Gorges de l’Ardeche. You will find beautiful gorges en lovely little beaches . And, let us not forget the lake, le Lac de Villefort; it is a large mountain lake and an absolute must. The whole lake is surrounded by an excellent walking track.If you feel more like a sandy Mediterranean beach, the sea can be reached within 90 minutes by car. For those of you who are into an even more active way of life, there are a number of opportunities. Various canoe expeditions are to be joined. Walking, hiking, cycling and mountain biking are all there for you. Mountain bikes are for hire in Barjac. Horseback riding is another way of exploring the area. Horse farm ‘le Malibaud’. organises guided tours on horse back. Feel like a round of golf? Enjoy the eighteen holes on the course of Nîmes! There are a number of museums, churches, castles and archeological sites to be visited and they are all close by. Cities like Nîmes, Uzes, Avignon and Orange will not disappoint you. For those of you who are looking for flora and fauna, don't miss out on the boat trip on the ‘Confrerie de bateliers de l’Ardeche’. The trip takes you through the de ‘Rèserve Naturelle’ one of the most beautiful (protected) nature conservation areas of France. Quite close to our home you can visit one of three of France's most well known caves La Grotte de Cocaliere, simply breathtaking! 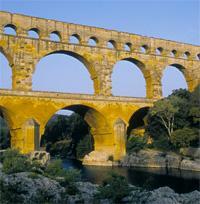 You probably heard a lot about the Pont du Gard, listed as world heritage!, it will definitely be on your list too. What do we have for our young visitors? The Indy Parc offers all sorts of thrills for the young (as well as the not quite so young). If you want to find out how crocodiles live, the crocodile farm is the place to go. For those who want to know everything about those yummy tasting, teeth wrecking sweets made by Haribo, visit their factory near Uzes. 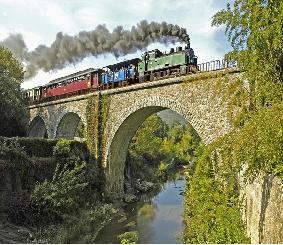 Something the whole family will enjoy is a ride on the old steam-train Anduze, right through the Cevennes. Combine this with a visit to the bamboo forest La Bambouseraie and your day is well spent.